Rosie and Jessica's Day of Fun – Things we do and make and see. We’re taking another dip into the archives with a Yesterday of Fun from 2017. Back then, Jessica was entering a period of funemployment that mainly consisted of shredding. There was a late review of the movie Austenland and Rosie was eating a lot of Nobbly Bobblys. Rosie and Jessica are on an asynchronous schedules so, to save you from a podcast-less existence, we’ll be diving back into the archives to hear some Yesterdays of Fun. Today we’ll be looking back to 2013 and Episode 21: Trumpets and Pop Tarts, in which Jessica moves house and Rosie is hoovering a crevasse. In episode 118, Rosie and Jessica have been inundated with cinematic spiders. They’ve been catching up on lots of television (Killing Eve), movies (see above) and stand-up (see above that) over the Christmas break. Rosie’s got a shop, Jessica’s got a new job and everyone likes dumplings. It’s here again the annual Christmas Eve reading of Clement C. Moore’s Twas the Night Before Christmas by Rosie and Jessica’s dad. This is its sixth outing and we hope it is as much a part of your Christmas as it as of ours. In episode 117, Rosie and Jessica make a triumphant return to the studio to catch up on the events of the past few months. There have been holidays, business purchases, the ruin of a once great nation and our favourite formerly dead horny raccoon. Plus our annual fundraiser for Crisis at Christmas which you can donate to and make someone’s Christmas merry and bright. Episode 116.5: Cut, Print, Emmy! 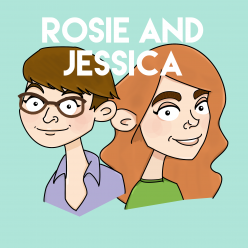 In Episode 116 and a half…well, Rosie and Jessica haven’t been able to come to the mic much. In lieu of our normally schedule programming, here is a peek behind the curtain at our Patreon with the bonus episode that some of our supporters received for Autumn 2016. We play at being hot shot tv producers and use The Ringer‘s guide to pricing tv shows to pitch our own. It’s great fun, as far as we remember! Posted on November 25, 2018 November 25, 2018 Categories podcastLeave a comment on Episode 116.5: Cut, Print, Emmy! In episode 116, Rosie and Jessica have had all sorts of upheaval – well, one of them has. Jessica’s been on a day trip, while Rosie has moved house and re-entered the workforce. If you need something cosy and comforting to watch while the world burns around you, it’s a giant Top 5 of recommendations for Bake Off Methadone – television to watch when you’re out of Mel & Sue. In episode 114, Rosie and Jessica get caught up on tea parties, weddings and how early is too early for a free screening (even with free pastries.) Then, just in time, is a Late Review of Emo: The Musical. There’s been lots of action in kitchens, at allotments and on sewing machines in a literal jam-packed Needle and Fed. It’s not stress – it’s Pooh.